Could you tell us what you do at Jumper.ai? Jumper.ai is a social commerce tool that enables brands to turn their social media engagement on any platform into direct sales. We do this without having to redirect the users to another website or online store so it’s a much simpler and direct method of selling. The key benefit is cutting out a number of steps from the traditional social media sales funnel. Users can purchase in what is, effectively, a 2-step sales funnel. They engage with the post of a product they want and the automatic checkout begins. Our headquarter is based in Singapore. However, we have team members all over the world including Thailand, London, and California. Currently, the team counts 18 people. 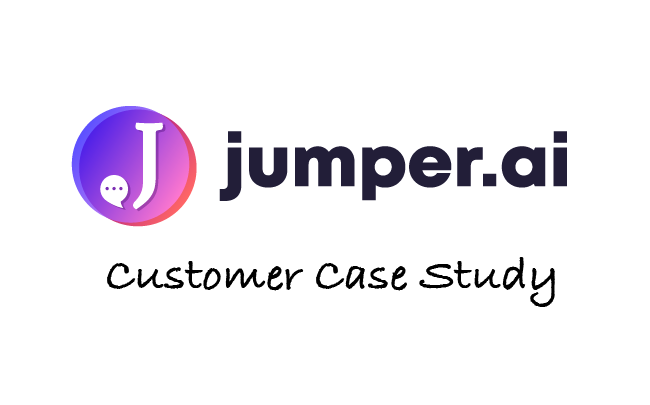 The company was founded by Yash Kotak, current CEO of jumper.ai and Nyha Shree, who handles the day to day operations and heads global marketing for the company. The inspiration to start the company came from Nyha’s own experience on shopping via social media. Much like most users, she was searching social media for trends and inspirations on what to wear for an event. It turned out to be a painful experience, though. Either it was tough to find the product she liked on the particular website or the designer didn’t even have a website at all and asked to direct message for more details. She wanted to buy something she liked on social media in a quick and easy way, but it turned into a nightmare of a long purchase journey instead. Around the same time, we had just sold a startup and were thinking on the next idea to work on. From our past companies, we knew that managing and selling to an ever increasing number of customers on social media was a nightmare even for the brands we earlier worked with. We knew customer buying behaviors were changing and there was no solution addressing it. After experiencing the buyer journey on our own – it was a no-brainer to start jumper.ai. We use it for all of our cold outreach. Andrew in Partnerships uses it to reach out to other brands who we could potentially partner and integrate with. Andrew also uses it to reach out to Shopify/BigCommerce store owners to see if they want to trial the tool. Anna in the Growth Team uses it to connect with influencers for joint promotions. And for content, Nyha uses it to reach out to influential publications for content collaborations and co-marketing efforts. It’s basically the hub for all of our cold outreach. Outbound is a significant source of new business for us. All the major marketing teams use outbound email marketing as at least a part of their growth strategies. We considered a number of different CRM systems for the cold outreach, but always found some form of limitation with the service. We ran the free trials for as many as we could and then compared the results. Woodpecker was not only the most effective but also the easiest to set up and optimize. Right now we’re focusing on e-commerce. However, we also have the functionality to allow event organizers and restaurants to use our social commerce solution to generate sales through their social networks. We are working with the likes of Marvel, Ben and Jerry’s, among 1000 other big and small merchants across the globe. You can read the Marvel case study here. The more general answer is that our target market is any brand that sells products or services through digital channels. Brands of every size have benefitted from jumper.ai. For e-commerce, we have some pretty easy targeting options. The first is store owners who are earning over a certain threshold with their store. We also want to partner with other e-commerce SaaS brands to ensure we can help as many merchants as possible. To get these, we have an assistant crawl the sites of ideal targets to find the email addresses of the ideal contact within that company. The assistant also crawls the social media to find influencers of a certain caliber to reach out to and see if they want to use the tool. We add 50-100 prospects every week to the content campaigns. That lets us check the results and amend the emails as we go. It also makes it manageable for us to handle the responses. When it comes to the Shopify store owners, we have campaigns including around 20,000 recipients. We generally do a 1-2-3 process: one cold email and two follow-ups. Funnily, we’ve found the first follow up to be the most effective at generating responses. We personalize the emails with personal and company names, and then we segment campaigns based on the company’s focus. So we might batch 50 close competitors together in one campaign and send a general message to them but because the batches are small the message is pretty relevant. What’s your best open and reply rate? Our best open rate is 83.2% and best reply rate is 17.1%. What have you gained by using Woodpecker? We can say it’s definitely helped us get featured in a number of publications (double digits) that have drastically increased website ranking. We’ve also managed to close some deals from an outbound campaign for content. It’s so simple to use. The campaign follow-up process is clearly defined and easy to follow. That and setting up new campaigns makes it incredibly easy to stay on top of your outreach. That’s all from jumper.ai. If you want to get more e-commerce and social media marketing insights visit their blog. Next postWhat is the Risk of Embedding an Image/Video into B2B Email?